Are you searching for a skilled contractor to have your West Fenwick Delaware roof coated? Tom McDonald Contracting has applied quality coatings to the roof tops of small businesses and homes since 1990. Tom McDonald Contracting's roof coating team uses top quality coating products and current best practices to produce the lasting results you're after. Call (302) 219-7939 to hire a professional to properly coat your roof at very affordable rates. The most frequent reasons people give for wanting to apply roof coating include lowering their energy expense and increasing the lifespan of their roof with the application of a protective coating. Here are a few other great reasons to call Tom McDonald Contracting for coating a roof in West Fenwick. Roof Coating is a smart choice for many types of roofing systems. Roofs that accept applications of coatings include metal roofs, concrete roofs, single ply and built up roofing. Depending on the type of roof you have, the pros at Tom McDonald Contracting can steer you toward the correct roof coating products to suite your needs. 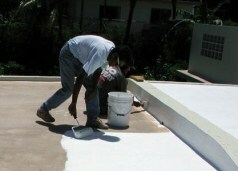 Each of these roof coating products works best on a certain roof system. With over 29 years experience, let the expert staff at Tom McDonald Contracting help you make the right decision on which roof coating is right for your roof. Call (302) 219-7939 today for a free quote. How do Cool Roofs in West Fenwick Lower Costs? The most obvious way in which coating your roof in West Fenwick saves money is through reduced energy usage. The reflective properties of the coating decrease the temperature of the roof and reflect the sun's rays. The result is that your air conditioning unit doesn't have to work as hard to keep your building's interior cool, saving on your electricity bill. In addition, roof coatings extend the life of the roof, meaning you won't have to replace your roof as soon. Roof coatings can last up to 10 years. By adding a coating to your roof in West Fenwick, you are also providing a water-tight barrier, which will prevent water damage from leaks that can occur over time, especially during months of harsh weather. By protecting your home or office building with this barrier, you are reducing your changes of costly repairs from roof leaks. Are you ready to start saving? Call West Fenwick's roof coating pros at Tom McDonald Contracting for a quick visit to assess your roofing needs.